New Mum Online: What do Nivea, Xbox, Facials, Champagne and Bloggers have in common? What do Nivea, Xbox, Facials, Champagne and Bloggers have in common? Well in answer to that question it is that they were all in the same place on Tuesday night. I went to a an exclusive fitness and beauty event for bloggers Tuesday evening which was to celebrate a unique collaboration between games developer Ubisoft and worldwide beauty brand NIVEA. What was great, is that it wasn't just Mummy bloggers; there were fitness bloggers, beauty bloggers, gadget bloggers and even a couple of travel bloggers. Such a diverse mix of people and a lovely atmosphere. I already wrote about it very briefly here Tues night when I posted a pic of me having a yummy facial with luxurious Nivea products. Here's me again... bliss! I would say I'll buy the products, but we got them in a goody bag. Fab! The event was held at: Kettners, 29 Romilly St. It's a gorgeous restaurant and bar in Soho. I didn't get home till 10:30 p.m. and had a couple of drinks (delicious cocktails) and it was only my 3rd night out since Aaron's birth and he's 11 months! I was delighted to bump into Hannah from Mummy and the Beastie and Kerry from Multiple Mummy on the way in. We were invited due to our tweets about MomenTum. As we are online friends it was extremely fortuitous to bump into them on arrival. Ubisoft and NIVEA have teamed up in what is a global approach to body care and exercise. 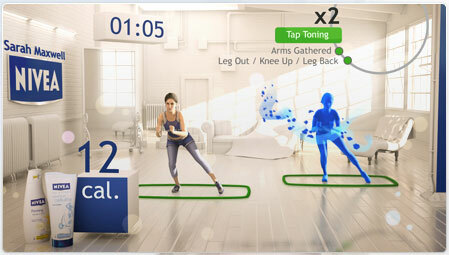 We can address fitness right from the comfort of our sitting rooms, through their Ubisoft game: Your Shape: Fitness Evolved – revolutionary for Xbox 360 with Kinect (this is the camera that tracks your movements). That'd be you on the right - literally in the game! What's disappointing about the photo above is that the person on the right looks so perfect you are probably thinking they are based on the Trainer on the left? Wrong! The person on the right would be YOU if you were playing the game. They've obviously used a "perfect" model who does the poses "perfectly" for the above, which doesn't really drive home the fact that it would be you, warts and all, in the game. Wriggle your FINGERS and you'll even see it on screen. Trust me I have tried. And it is NOT heat sensitive. Wave your scarf and your onscreen self will do tooooooo. In addition to the game itself there is also free downloadable content from NIVEA. It features health and fitness consultant to the stars, Sarah Maxwell. Sarah is NIVEA’s International Fitness and Lifestyle Expert and spokeswoman, developing fitness programmes to compliment NIVEA’s skincare product ranges. The free downloadable content can be viewed here. She was there on the night and we were able to chat to her. I chatted to her whilst waiting for my face reading. You can watch a demo of the Your Shape Fitness Evolved game here. It really is breakthrough technology which I think blows Wii Fit out of the water. As you can see on the short movie, it even tracks your clothes. Both you and your Trainer are featured onscreen. No remote controls required. Absolutely amazing. I say this having been a Wii Fit owner for over 2 years, and having spent a good while trying the game at the event Tuesday night. The PR lady from Immediate Future took pics of me while I tried out the game and let's just say they have been a huge wakeup call :-( Apologies for the quality but she was using my camera and it doesn't cope with motion very well. So I already saw my digital self on screen on the night and wasn't impressed with how dumpy I look! But seeing the photos too further confirms it. I really need that fairy Godmother and Your Shape in my very own living room. I queued for ages to have my face read which is called Al Ferasa. I cannot believe the amount of accurate things he told me about myself - it was spot on and felt like a session of marriage counselling - it's really given me clarity on "who I am" and what my trigger points are. Also made me believe strongly in what my positives are which is a boost I was much in need of. Before that I saw the Kinesiologist, who was also spot on. It seems I have my Candida back which I kind of half knew. And really high blood sugar which I need to address. She said I should give up sugar and coffee which I have not yet done. She also said I have adrenal exhaustion and need to build my cortisol levels back up. I could have guessed this too, as the adrenals are part of the "fight or flight" response in your body, which I have hammered in the 6 weeks back at work. You can address it by looking after yourself which I haven't been. Anyway I came away from her with a to do list of things to purchase and things to do. Been busy at work this week but will get cracking as soon as I can as it is serious and I want to nip it in the bud, lose some weight and get my energy back. We've been put under no pressure to write posts about the night, but it was great and it is only a pleasure to write about it. I had a superb night and it's probably the highlight of 2011 for me, now that I go out so little. Also, given my MomenTum targets, I really want and need that game! Whoever is listening :-) Due to my lack of an Xbox I have given the game - rather reluctantly - to my friend, who told me a few weeks ago that Xbox is better than Wii Fit..... sorry Mita it took me going to this event to believe you - but you were so so right!